2009-2018 Harley touring New Money Kit! Dealers must call or email before ordering! Dealers must call or email before ordering ! Dealers must call or email before ordering this kit! Make your own complete Rear End Kit! Choose your Rear Fender, choose your bag option and corresponding side covers will come with! 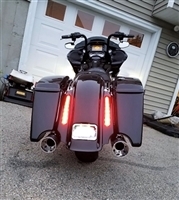 All kits come with TopShop Super Bright CVO Lights and wire harness and lighted plate frame! Please allow 4 weeks until shipped! FREE SHIPPING for the Lower 48! Please email smittyscustompainting@gmail.com with any questions! Dealers must call before ordering this KIT!